Are you taping up your webcam or giving Gerald a show? My laptop webcam has been taped over since around 2015, when those gruesome stories started circulating about hacked webcams taking pics of unsuspecting victims and being used to find out where people lived. Now it seems we’ve found a different way to cope with this fear: memes. The FBI agent meme recently popped up on Twitter, based on the premise that everyone is being individually monitored by a personally assigned FBI agent. One tweet from Shon Faye reads: “If I ever met the FBI man who watches me through my webcam the first thing I’d ask him is if I take a successful thirst trap quickly compared to the other people he’s monitoring”. @joeykaywho wonders: “Does the FBI agent watching me through my webcam see me cry over Grey’s Anatomy or does he cry with me”. There are thousands of tweets along these lines, most of them imagining an FBI agent observing us taking selfies, obsessively scrolling through our social media feeds, and binge-watching Netflix. It’s funny because it’s absurd. We know there isn’t a man called Gerald watching us through our webcam, giving us dating advice or judging our Google searches. Still, there are deeper anxieties behind the FBI agent meme as well; in the U.S, threats to net neutrality (a principle that basically ensures all internet users have equal access to the internet regardless of what they’re using it for) have compromised the sense many of us once had that the internet is a free, limitless space. The fight against the UK’s ‘Snooper’s Charter’, which gave the government mass digital surveillance powers – reading your texts, accessing your internet browsing history just because – continues. This sense of a loss of freedom is compounded by the increasing feeling that our every move is being observed by social media – whether that’s on the ‘Snap Map’ or in the suspiciously accurate targeted ads you see on Facebook. Vince Azada, 17, runs @VINCHY, one of the many popular Twitter accounts to get in on the FBI agent joke. On the topic of this meme, he says: “yeah – the government is spying on us so why not make the best out of it and make memes”. Though concerned about government surveillance, he also had a fairly chill attitude to the prospect of his online activity being monitored, admitting: “the only thing they’re gonna see from me is a whole lotta selfies being taken and some, uh, browser history”. This does seem to be the overwhelming feeling behind the FBI agent meme – even if there was someone watching your every intimate move through your phone or laptop, the prospect doesn’t seem so far removed from a world where we already document most of our lives on Facebook, Instagram, Snapchat, and Twitter. The FBI agent has appeared in tweets about a number of current events, including Kylie Jenner’s birth announcement, about which @artwbu wrote: “The FBI agent assigned to Kylie Jenner’s computer has to be the most loyal person to ever walk the planet”. There is a sense that this (not so) imaginary surveillance pervades every aspect of daily life, including pop culture and the lives of celebrities. The FBI agent meme is one in a long line of URL jokes about various current events and the ever-changing relationship young people have with their online presence. There might be an element of concern behind the FBI agent meme, but the very act of making memes is itself comforting and minimises the source of anxiety it began with. The idea that this meme is raising awareness of a genuine threat has already become part of the meme narrative. @uhh_elijah tweeted last week “an FBI agent probably started the FBI agent meme to gauge our reaction to being spied on and since we’re all hella chill about it we’ll prob actually be assigned FBI agents soon”. The rise of the socially conscious meme is a good coping mechanism for young people trying to deal with the shitstorm that is politics and our rocky social climate in 2018. 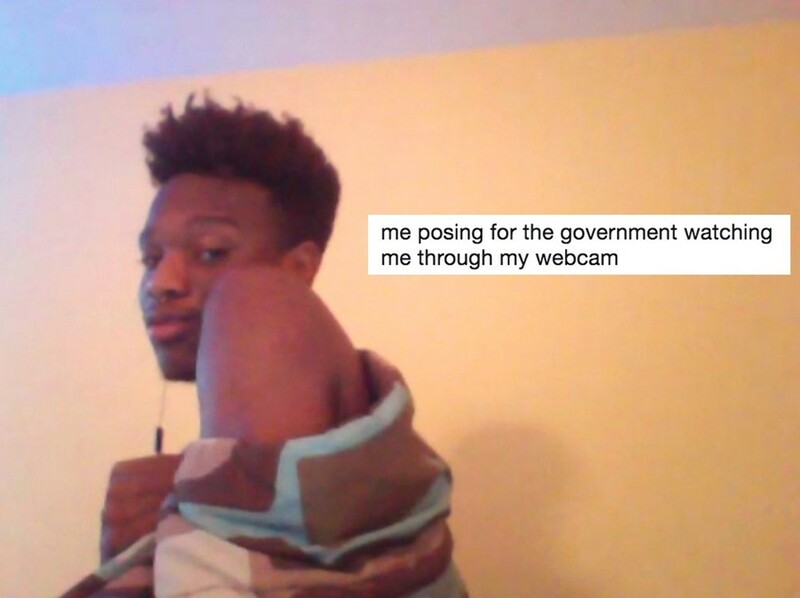 So have fun with it – keep memeing, keep protesting, and… maybe tape over your webcam.